In the course of driving a variety of different racing cars, I came to realize that none of them had the ideal steering wheel, so I thought to myself, “Why not make the ideal wheel yourself?” That was around the same time that I started my career as a works driver and so I went ahead and did it. At first, I was the only one using the new steering wheel but, as it happened, the new wheel became popular among fellow drivers over time and more and more professional teams began to fit it in their cars. So I said, “OK, then, let’s make it available to everyone who loves cars and driving, not just the racing fraternity,” and that’s how this series of original steering wheels came into being. It took a pretty long time to complete the development project because the steering wheel is the only part that drivers can touch and really feel their machine through, so we refused to accept any compromises. The product underwent extensive testing by not only me but also many other top-class professional racing drivers, including champions in the Super GT Series and the All Japan Touring Car Championship, as well as winners of the All Japan Rally Championships and the All Japan Gymkhana Championships. They gave me invaluable advice and actively participated in the development project. 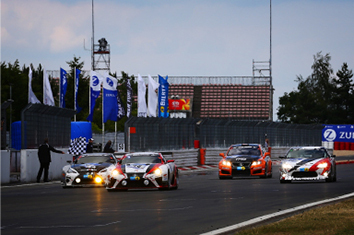 The steering wheel was fitted in racing cars running on real race tracks, including the Lexus racing machine and Gazoo Racing’s car that won the 24 Hours of Nürburgring endurance race. We put the steering wheel through a whole range of challenging situations because we were aiming for perfection. You’ve probably figured out by now why we say that this steering wheel is the real deal. As a driver, you don’t want to grip your steering wheel tightly. Instead, you want to hold onto it lightly. You need to be relaxed when you drive so you can sense how your car is behaving and quickly and accurately understand your tires’ contact with the road surface. That’s why we made the grip on the steering wheel rather thick. It was designed to foster a relaxing driving experience all by itself. This has made it ideal for driving on the street as well as on the race track. The biggest challenge was striking the right balance between stiffness and suppleness. While we got the stiffness to the highest possible level, we also used our ingenuity to achieve a comfortable fit to the driver’s hands. Now drivers can obtain accurate information through the steering wheel thanks to our meticulous attention to this point. Each individual steering wheel is manufactured by hand. I hope you enjoy the craftsmanship, too. Many people who drive mostly on race tracks, as well as professional racing drivers, have chosen this flat-spoke type. 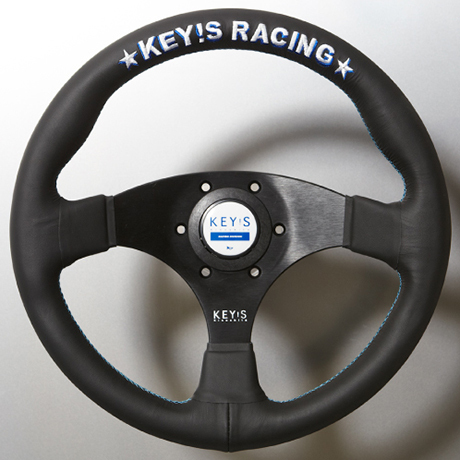 The thick grip and reassuring feel, which are the signature features of Key’s Racing Steering Wheels, are designed to provide powerful assistance to drivers in marginal driving conditions where lateral g-force is high. Another characteristic of this product is the dimples where the driver’s fingers are in contact with the wheel; this improves the fit to the driver’s hands. This has been a highly popular and widely desired feature among professional drivers, who can relax and rest their palms on the steering wheel and concentrate on the vehicle’s behavior. All Key’s Racing Steering Wheels are wrapped with quality cowhide and you can choose either a Suede or a Smooth Leather wrap depending on your usage and preference. My recommendations are Suede for driving enthusiasts prioritizing performance on race tracks, because it gives a stronger sense of gripping, and the beautiful-looking Smooth Leather for people who like driving in the city. Position: The wheel center sits 20mm toward the driver from the surface of the steering wheel boss. While this type features the same robust grip as the Flat Type, its depth is between those of the Flat Type and the Deep Type. Whereas the wheel centers of the Flat Type and the Deep Type respectively sit 20mm and 80mm towards the driver from the surface of the steering wheel boss, the center of the Semi-Deep Type sits 50mm towards the driver. This design was created to meet the high expectations of professional-level drivers who are more meticulous about their driving positions. The steering wheel itself is positioned slightly closer to the driver than in the case of the Flat Type. Quality thread in blue and white—the colors of Key’s Racing—is used to stitch the cowhide on the wraps. The stitching adds a great accent to the whole ensemble. This is our most popular steering wheel. Position: The wheel center sits 50mm from the surface of the steering wheel boss toward the driver. More than a few drivers choose the Deep Type based on their vehicle type or preferred driving position and other personal preferences. This deep-cone steering wheel is characterized by its wheel center sitting 80mm toward the driver from the surface of the steering wheel boss. The wheel has shallower dimples to prevent the fingers from being caught by the surface of the grip. The product is also characterized by its compatibility with quick, hard maneuvering of the wheel during, for example, All Japan Rally Championship or drift driving. With the Deep Type, the Suede wrap has proved particularly popular among motorsports enthusiasts. 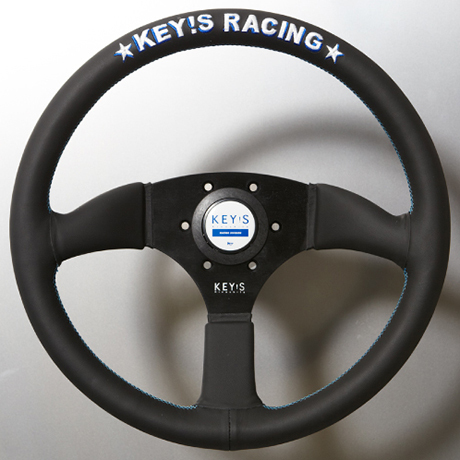 The horn button is decorated with the KEY’S RACING DIVISION logo in bright blue (a feature common to all models). It features punched spokes and a quite simple shape. High stiffness is another characteristic of this product. Its wheel center sits 80mm toward the driver from the surface of the steering wheel boss. Thanks to the special attention paid to increasing the stiffness, this product can stand up to hard driving. Position: The wheel center sits 80mm toward the driver from the surface of the steering wheel boss. To complement our lineup of products with round designs, we offer this D-shaped type featuring a straight line at the bottom. A deep-cone steering wheel tends to be preferred among drivers competing in the D1 Grand Prix series and rally car drivers, who need to turn frequently and manipulate the steering wheel quickly and aggressively. On the other hand, many racing car drivers and city drivers tend to prefer Flat, Semi-Deep, or D-Shaped steering wheels. This product has been particularly popular among drivers who like to dress up their vehicles for city use. Just like Formula racing machines, including F1 cars, the bottom of the wheel is a straight line across. This kind of specification is preferred by advanced drivers who keep both hands on the wheel while driving. The Smooth Leather-wrap version of our D-Shaped Type features special dotting applied to the grip where both hands rest on the wheel for prolonged periods. This not only serves as a design accent but also adds suppleness to the texture and improves driver comfort. You cannot fail to feel its high quality. Position: The wheel center sits 50mm toward the driver from the surface of the steering wheel boss. This product is designed exclusively for drift driving. It is based on the Semi-Deep Type, but we have removed all the dimples from the grip. When driving on city streets, driving on winding roads, or driving aggressively under marginal conditions on race tracks, the driver’s hands must “interlock” firmly with the steering wheel and we therefore generally add dimples to the internal surface of the wheel. But for drift driving, where drivers sometimes “cut” the wheel extremely hard, the dimples could interfere with the intended manipulation. That’s why we removed the dimples. The biggest characteristic is the removal of the dimples from the steering wheel. This is good for swinging the wheel. 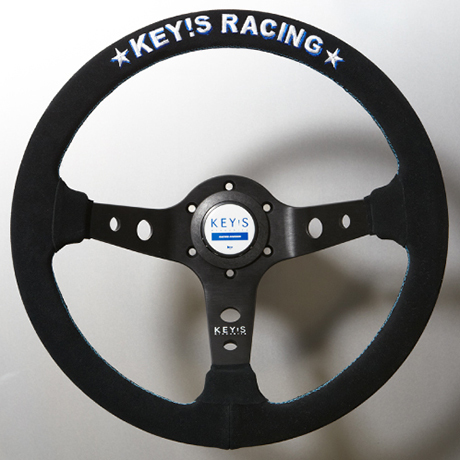 The vertex of the steering wheel features the KEY’S RACING logo embroidered in quality thread. 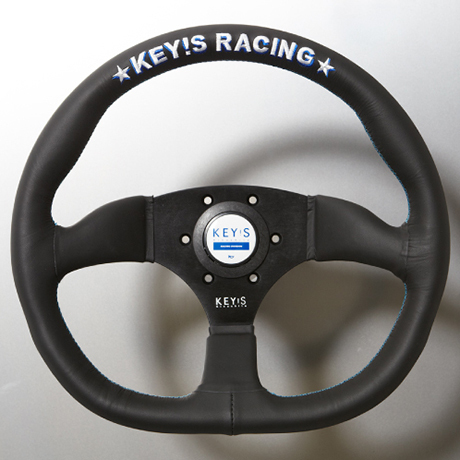 Key’s Racing offers a gear shift knob as well as steering wheels. In developing this product, we incorporated into it the texture and level of perfection of our steering wheels. To enable drivers to move the lever in a fraction of a second, maximum consideration was given to comfort and the feel of gripping the knob. The knob shares the same design themes as the steering wheel. I think that using our shift knob along with one of our steering wheels will give you a personalized cockpit. Naturally, the KEY’S logo is embroidered in quality thread on the product. As with our steering wheels, it is offered with a Suede or a Smooth Leather wrap. Nonslip Suede is recommended for hard driving, while Smooth Leather is ideal for city driving and the creation of a stylish cockpit. A three-dimensional rendition of our KEY’S RACING logo is engraved on a ring at the bottom of the knob. 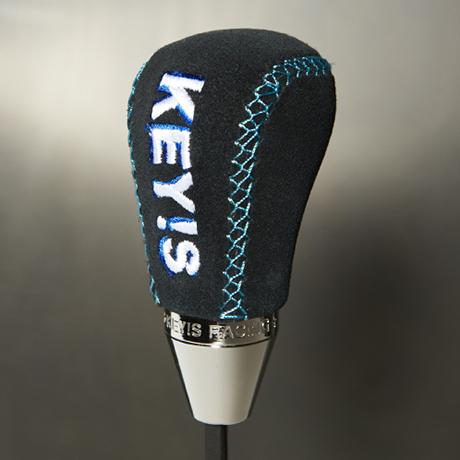 The Key’s Racing Shift Knob can be installed on most of the cars of both Japanese and overseas makers by using the included attachments. For compatible vehicles and how to install the knob, refer to the explanations below. Original factory-fitted knob is removable and original factory shaft measures 8mm or 10mm in diameter. Any screw pitch is OK.
Toyota, Mazda, Honda, Daihatsu, Mercedes, etc. Original factory-fitted knob is removable and original factory shaft measures 10mm, 12mm, or 14mm in diameter. Remove original factory gear shift knob. Drop bottom cover (either chrome or black) onto original factory shaft. Fix resin inner sleeve compatible with screw diameter of factory shaft. (a) Resin inner sleeve edge bearing number (i.e., 10, 12, or 14) should be at top. (b) Resin inner sleeve is fixed not by tightening screws but by threading sleeve. 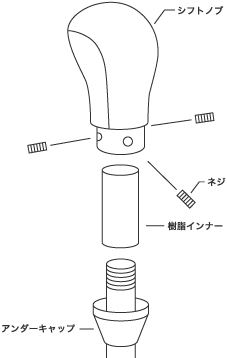 (c) Resin inner sleeve is used only to stabilize upper part of shaft, after product has been fixed with three screws as described below. Put knob over top of original shaft. Fix knob with screws that fit diameter of holes in factory shaft. (a) Do not fix screws over resin inner sleeve. (b) Fix three screws directly to factory shaft. Fix bottom cover to knob. ◆The product is 85mm long inside. If the original factory shaft is longer than 120mm, the product may be fixed in a high position. On the other hand, if the original shaft is short, for instance around 100mm in length, the product needs to be fixed at a relatively high position on the original shaft. In this case, the bottom part of the resin inner sleeve needs to be trimmed to prevent it from interfering with the screws. Because the fixing positon of the product is arbitrary, you can decide where to fix it. For original factory shaft measuring 8 or 10mm in diameter: Use 6mm-long screws. For original factory shaft measuring 12 or 14mm in diameter: Use 4mm-long screws. For “payable on receipt” service, we cover the handling fee. For “bank transfer” service, we ask that you pay the handling fee.